In this video we will discuss about Lead and Lag functions. Offset - Number of rows to lead or lag. 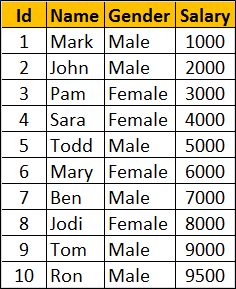 Default_Value - The default value to return if the number of rows to lead or lag goes beyond first row or last row in a table or partition. If default value is not specified NULL is returned. Lead and Lag functions example WITHOUT partitions : This example Leads 2 rows and Lags 1 row from the current row. When you are on the first row, LEAD(Salary, 2, -1) allows you to move forward 2 rows and retrieve the salary from the 3rd row. When you are on the first row, LAG(Salary, 1, -1) allows us to move backward 1 row. Since there no rows beyond row 1, Lag function in this case returns the default value -1. 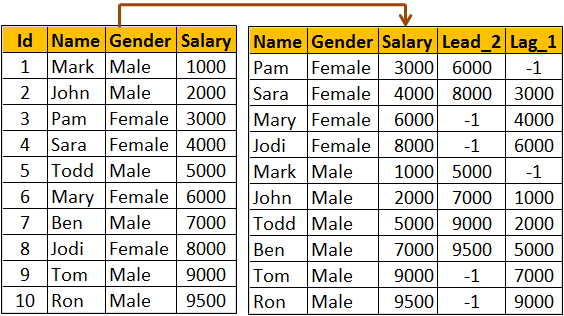 When you are on the last row, LEAD(Salary, 2, -1) allows you to move forward 2 rows. Since there no rows beyond the last row 1, Lead function in this case returns the default value -1. 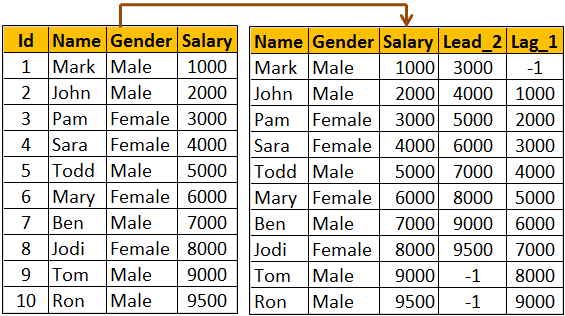 When you are on the last row, LAG(Salary, 1, -1) allows us to move backward 1 row and retrieve the salary from the previous row. Lead and Lag functions example WITH partitions : Notice that in this example, Lead and Lag functions return default value if the number of rows to lead or lag goes beyond first row or last row in the partition.